We all remember what happened during Hurricane Sandy, with winds averaging 70 miles per hour, and an estimated $20 billion in property damage. It was one of the largest hurricanes to ever hit the Northeast coast. 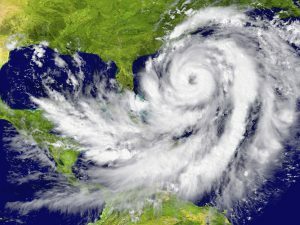 Hurricane season lasts until November 30th, so keep your home safe this season by preparing with these easy tips and suggestions. Protect your windows and doors from fast winds and flying debris with shatter resistant glass or shutters. Keep your yard clean of any debris, like tree branches, wood piles and lightweight patio furniture. A tropical storm can have winds between 35-70 miles per hour. With that type of speed, a small branch on your lawn can do some serious damage. Think of the design of your house. If you’re buying a new home or currently building it, look for building features that protect it. Houses near the water should be raised to prevent flooding, and in areas with frequent storms, houses with flat roofs are the safest. Protect the garage door against strong winds. If a hurricane blows your door in, the wind can enter your house and potentially blow the roof off. The best way to protect your home is to brace and stabilize the door well before hurricane season. Know where the water is going throughout your yard. Water is going to collect somewhere, so make sure it’s not in your attic or basement. Always keep gutters and downspouts clean of leaves or other blockages and keep them angled away from your home and toward the street. Keep the lights on with either a whole-house or portable generator. When the lights go out, you don’t know if it will be hours or days before the power comes back so be prepared with a generator for at least the basics — like a few lights, the refrigerator and hot water heater. Have basic supplies on hand — like candles, bottled water, batteries and a hand crank radio. The National Hurricane Center suggests families have these items in an emergency kit, as well as practice annual safety drills. If even your best efforts were not able to protect against this year’s storms, call on the experts at North East Home Improvement right away. Whether your home has been damaged by wind, rain, lightning, or snow, we offer the materials and quality workmen to repair damaged sections to their former condition.